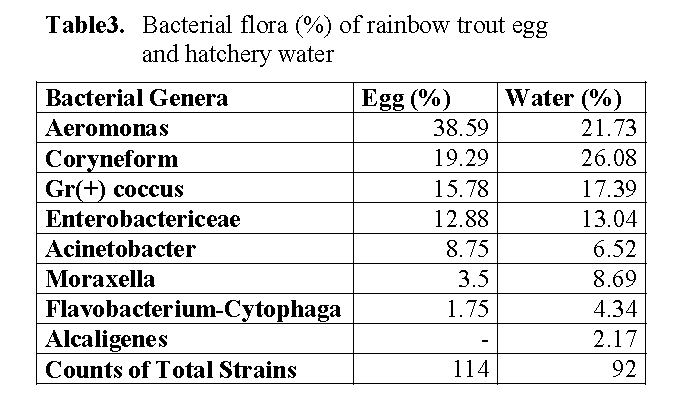 Aerobic bacterial flora in rainbow trout egg, Oncorhynchus mykiss, Walbaum 1792, and the hatchery water were analyzed. It was determined that the number of bacteria varied between 103-104 cfu g-1 in disinfected eggs and 106-107 cfu g-1 in undisinfected eggs. The total bacterial count was 5.7x 102 cfu ml-1 in the spring water for the hatchery. The total bacteria counts of outlet water from trough were higher than the inlet water to trough. The bacterial loads of milt and unfertilized egg were also found to be 103cfu g-1. In this study, a total of 206 strains were isolated from rainbow trout eggs and hatchery water. Among the bacterial flora of eggs and the hatchery water, comprised of Aeromonas, Coryneforms, Gr (+) Coccus, Enterobactericeae, Acinetobacter, Moraxella, Flavobacterium-Cytophaga constituted groups. The hatchery water was also included Alcaligenes. Aeromonas and Coryneforms were most dominant (38.59 %) and (19.29 %) in eggs respectively. Coryneforms was predominant (26.08 %) in the hatchery water. Incubation of salmonid egg results in varying degrees of success. Loss through death of incubating eggs and fry is likely to be due to a wide range of causes such as water quality, sperm motility and time of stripping (Barker et al.,1989, 1990). Moreover, husbandry practices such as excessive illumination, physical disturbance of eggs before eyeing and failure to prevent fungal colonization can also influence egg and fry survival (Barker et al.,1989, 1990; Shephard and Bromage 1992; Pillay 1993). However, numerous observations have been led to speculation that microorganisms, particularly bacteria, might be at least partly responsible for some mortality of salmon eggs incubating in hatchery (Bell et al., 1971). With the numerous studies, bacteria have also been shown to be associated with out side of salmonid eggs but particularly bacteria have not been directly implicated with egg death. Bell et al. (1971) have suggested that egg mortality probably depends more upon the results of complex interactions between the egg and micro flora and its ambient waters. Trust (1972) indicated that eggs maintained in poor water quality could promote bacterial proliferation and hence lead to eggs death. Cahill (1990) stated the physical and chemical conditions of the environment were considered to be most important factors in ensuring the survival of eggs as no specific bacterial pathogen for egg mortality was isolated. Sauter et al. (1987) revealed the presence of a wide range of bacteria within chinook salmon (Oncorhynchus tshawytscha Walbaum) eggs and considered that among other factors, bacteria might be important in determining death of eggs and fry. Barker et al. (1989) demonstrated that a close correlation existed between numbers of bacteria present on surfaces of incubating eggs and eggs mortality. Generally, a range of techniques can be used to reduce bacterial numbers on egg surfaces but it is obvious that considerable levels of mortality can always be expected to occur within hatcheries. The aim of the present study was to qualitatively and quantitatively determine the aerobic microflora of rainbow trout eggs and the hatchery water. Fish eggs were obtained from a rainbow trout hatchery at Milas- Isparta, Turkey, in January 2006. The eggs were incubated in hatchery troughs at 5-m long and 50-cm wide and 20-cm deep, at 10°C, pH 7.5 and O2 9 mg/lt. The troughs were supplied with 18 litters per minute of spring water. Eggs were stripped into individual sterile containers by abdominal pressure. The first eggs from each fish were discarded to avoid any contamination. Milt was also collected in sterile containers. Milt and eggs were immediately put on ice and returned to the laboratory. The eggs and hatchery water samples for bacteriological analysis were taken to sterile bottles using aseptic techniques. Then bottles were arrived at the laboratory within one hour. Undisinfected eggs and disinfected eggs sample for bacteriological analysis were sampled at 4, 10 and 30 day old after fertilization respectively. Eggs were disinfected externally by immersion in 1 % (w/v) benzalkonium chloride for 5 min. and rinsed three times with steril water. Ten eggs (1g) and 1ml milt were transferred to 9 ml of sterile diluents (0.1% pepton water) and homogenized (IKA). Bacterial count from the hatchery water and undisinfected eggs were obtained by same method. After homogenizing, the total volume was adjusted to 10 ml sterile water and homogenate was serially diluted ten-fold in sterile water. 0.1 ml of each dilution was spread on triplicate agar plates. Plate count agar (PCA, Merck) was used to count the total number of aerobic bacteria. Plates were incubated at 22oC for up to 7 days. Following incubation, plates containing 30-300 colonies were used to calculate bacterial population results. By taking in to account the dilution factor, the volume of diluents, the number of viable colony forming units (cfu’s) per g was estimated (Collins and Lyne 1976; Austin and Austin 1989). All 206 isolates were examined by the phenotypic test. Representative colonies of the morphologies from plates with well isolated colonies were purified on TSA (Merck) and stored at 4°C. Routine tests for determining biochemical characteristics of the isolates were carried out as described in Cowan and Steel (1970), Allen et al. (1983), Holt et al. (1994). The bacterial counts differed among undisinfected eggs and disinfected eggs being highest in the 30 day old undeisinfected eggs and lowest in the unfertilised eggs (Table 1). The bacterial counts of eggs were increased from day 4 to day 30 after fertilization. The bacterial count and flora of hatchery water are shown in Table 1 and 2. 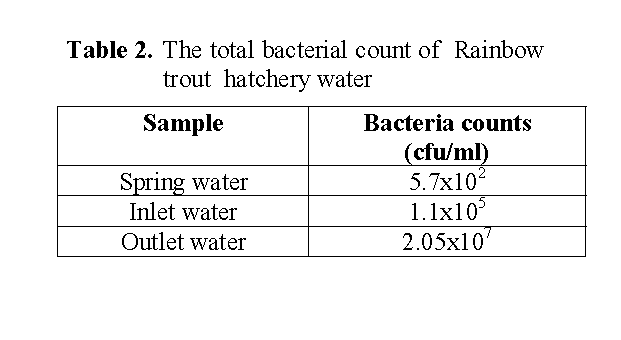 The total bacteria counts of outlet water (2.05x107) from trough were higher than the inlet water (1.1x105) to trough, while the spring water for the hatchery was obtained 5.7x102 cfu/ml (Table 2). 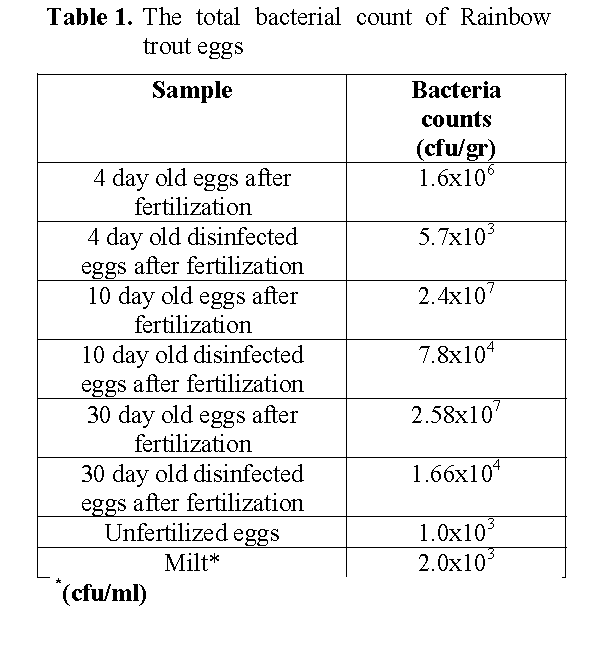 The bacterial flora of eggs and hatchery water are shown in Table 3. The flora composition of eggs was characterized by predominating group of Aeromonas followed by Coryneform, Gr (+) Coc, Enterobactericeae. Acinetobacter, Moraxella, Flavobacterium-Cytophaga. Similar generic composition was recovered in hatchery water. The water sample also included Alcaligenes (Table 3). Coryneform was dominant in the flora of the hatchery water. Numerous studies have been carried out on the microflora of various fishes (Ringo et al. 1995, Al-Harbi and Uddin 2003). However, there have been very few studies on the microflora of rainbow trout eggs. In this study, aerobic bacterial flora in the egg of rainbow trout and the hatchery water were carried out. Reports of total viable counts on fish eggs were 103 –106 g-1 (Cahill 1990). It was found that the total aerobic bacterial count was varied between 103-107 cfu g-1 in rainbow trout eggs. According to Trust (1972) the total bacterial count in the hatchery water was about 103 -105 bacteria/ml. Diler et al. (2000) reported that the bacterial load of rearing pond water in rainbow trout farm was 102-105 cfu/ml. Our finding agrees with these results. In the present study, the total bacterial count was102-107 cfu ml-1 in hatchery water. Our finding about the bacterial count of the hatchery water was higher than these results. The total bacteria counts of outlet water from trough were higher than the inlet water to trough in the current study. The present results showed that bacterial count in outlet hatchery water was high, one of the reason possibly being that the insufficient hygienic condition in hatchery water was close to optimum for many bacteria in natural systems. It was stated that the bacterial flora of eggs surfaces associated with bacterial flora in the surrounding water (Cahill 1990, Al-Harbi and Uddin 2003). Among the bacterial flora of eggs and the hatchery water, comprised of Aeromonas, Coryneforms, Gr (+) Coccus, Enterobactericea, Acinetobacter, Moraxella, Flavobacterium-Cytophaga constituted groups in this study. The hatchery water was also included Alcaligenes. As these results, the bacterial flora of the eggs reflected the flora of hatchery water. Aeromonas was higher in the eggs while Coryneform was dominant in the flora of the hatchery water in the current study. This finding agrees with Diler et al. (2000) reported that Coryneforms was dominant in pond water of rainbow trout. Hansen and Olafsen (1989) reported that the adherent microfloras on both cod and halibut eggs were dominated by members of the genera Pseudomonas, Alteromonas, Aeromonas, and Flavobacterium. It was reported that Cytophaga, Flavobacterium, and Pseudomonas spp. dominate on eggs of different Oncorhynchus spp. (Bell et al., 1971; Yoshimizu et al., 1980). It was stated that Vibrio spp., members of the Cytophaga-Flexibacter and Cytophaga-Flavobacterium groups, Acinetobacter calcoaceticus and Photobacterium phosphoreum determinated the dominant bacteria in a marine fish-rearing unit (Austin, 1982). Sugita et al. (1988) found that Flavobacterium spp., A. hydrophila, Pseudomonas spp., Micrococcuis spp., and A. punctata were predominant on goldfish (C. auratus) eggs. Nieto et al. (1984) reported that a comparative study was conducted of the microflora associated with gills, intestine, liver and kidney of healthy rainbow trout (Salmo gairdneri) taken from two different hatcheries located in the north-west of Spain. The main bacterial groups isolated from fish in both rearing facilities were Aeromonas, Pseudomonas- Xanthomonas, Enterobacteria and Gram (+) cocci. Members of Vibrio, Corynebacteria, Flavobacterium- Cytophaga and Moraxella- Acinetobacter were also detected in their study. Pathogenicity assays revealed that the fish carried a diversity of potential pathogens, since strains belonging to Aeromonas, Vibrio and Pseudomonas displayed some degree of virulence for rainbow trout. The Flavobacterium-Cytophaga group appear to be abundant members of the indigenous microfloras of both freshwater and marine fish eggs (Hansen and Olafsen, 1989). In conclusion, the present results indicate that, bacterial flora of eggs was influenced both quantitatively and qualitatively by the hatchery condition and fish species. It can be recommended to reduce bacterial loads in the eggs by disinfection of eggs and also sterilization of hatchery water with ultraviolet light. Allen,D.A., Austin, B., Colwell, R.R., (1983), Numerical taxonomy of bacterial isolates associated with a fresh water fishery. Journal of General Microbiology, 129: 2043-2062. Al-Harbi, A.H.,Uddin, N., (2003), Quantitative and qualitative studies on bacterial flora of hybrid tilapia (Oreochromis niloticus x O. aereus) cultured in earthen ponds in Saudi Arabia. Aquaculture Research, 34(1): 43-48. Austin, B., (1982), Taxonomy of bacteria isolated from a coastal marine fish-rearing unit. Journal of Applied bacteriology, 53: 253- 268. Austin, B., Austin, D.A., (1989), Methods for the Microbiological Examination of Fish and Shellfish.Ellis Horwood Lmt. 317. Barker, G.A., Smith, S.N., Bromage, N.R. (1989), The bacterial flora of rainbow trout, Salmo gairdneri Richardson, and brown trout, Salmo trutta L.,eggs and it is relationship to developmental success. Journal of Fish Diseases, 12: 281-293. Barker, G.A., Smith,S.N., Bromage, N.R., (1990), Effect of oxolinic acid on bacterial flora and hatching success rate of rainbow trout, Oncorhynchus mykiss, eggs. Aquaculture, 91: 205-222. Bell, G.R., Hoskins, G.E., Hodgkiss, W., (1971),. Aspects of the characterisation identification and ecology of the bacterial flora associated with the surface of stream incubating Pasific Salmon (Oncorhynchus) Eggs. Journal fisheries Research Board of Canada, 28(10): 1511-1525. Cahill, M.M., (1990), Bacterial flora of fishes: A review. Microbial Ecology, 19: 21-41. Collins, C.H., Lyne, P.M., (1976), Microbiological methods. Butterworths. 521p. Cowan, S.T., Steel, K.J., (1970), Manual for the Identification of Medical Bacteria. Cambridge University Press, 216p. Hansen,G.H., Olafsen, J.A., (1999), Bacterial Interactions in Early Life Stages of Marine Cold Water Fish. Microbial Ecology, 38(1): 1-26. Holt, J., Krieg, N.R., Sneath, P.H.A., Staley, J.I., Williams, S.T., (1994), Bergey’s Manual of Determinative Bacteriology. Ninth Edition. Williams and Wilkins, 787p. Nieto, T.P., Toranzo, A.E., Barja, J.L., (1984), Comparison between the bacterial flora ssociated with fingerling rainbow trout cultured in two different hatcheries in the north-west of Spain. Aquaculture, 42(3-4): 193-206. Pillay, T.V.R., (1993), Aquaculture Principles and Practices. Fishing News Books, England, 574p. Ringo, E., Strom, E., Tabachek, J.A., (1995), Intestinal microflora of salmonids: a review. Aquaculture Research, 26: 773-789. Sarieyüpoglu, M. 1988. Gökkusagi Alasi (S.gairdneri) Yumurta ve Spermlerinin Bakteriyel Yönden Incelenmesi. Doga Türk Zooloji Dergisi, 12(1): 110-113. Sauter, R,W., Williams, C., Meyer, E.A., Celnik, B., Banks, J.L., Leith D.A., (1987), A study of bacteria present within unfertilized salmon eggs at the time of spawning and their possible relation to early lifestage disease. Journal of Fish Diseases, 10: 193-203. Shepherd C.J., Bromage N.R., (1992), Intensive Fish Farming. Billing and Sons Ltd, Worcester, 404p. Sugita, H.,Tsunohara, M., Ohkoshi, T., Deguchi, Y.,(1988), The establishment of an intestinal microflora in developing goldfish (Carassius auratus) of culture ponds. Mi-crobial Ecology, 15: 333-344. Trust, T.J., (1972), The bacterial population in vertical flow tray hatcheries during incubation of salmonid eggs. Journal Fisheries Research Board of Canada, 29(5): 567-571. Yoshimizu, M., Kimura, T.,Sakai, M., (1980), Microflora of the embryo and the fry of salmonids. Bulletin of the Japanese Society of Scientific Fisheries, 46(8): 967-975.